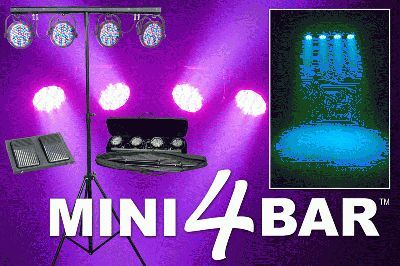 CHAUVET®, a leading manufacturer of LED lighting, announces their newest compact LED fixture, the Mini 4BAR™ [link: http://www.chauvetlighting.com/mini-4bar.html]. It’s a ready-to-go, mobile wash system with four low-profile lights, sporting 75 LEDs (25 red, 25 green and 25 blue) per head producing a multitude of colors. The fixture is a smaller version of the popular 4BAR™ [link: http://www.chauvetlighting.com/4-bar.html], but without the option of DMX control. It does have an easy-to-use footswitch controller and built-in sound and automatic programs—including RGB fades. In just five minutes this fixture can be set up and in use, plus each light can be positioned independently for maximum coverage. This versatility allows for the lights—mounted to a truss or the included tripod—to crisscross or be aimed at different elevations for an outpour of effects. Likewise the system—footswitch, lights and tripod—can be broken down easily and stored into two custom transport cases, which are also included. The Mini 4BAR™, with each light measuring 1.2 inches deep, is ideal for mobile DJs or the performer on-the-go. It weighs less than 17 pounds, is fully transportable and is a great low-heat replacement for power-hungry PAR cans.